Video of police aggressively arresting a University of Utah hospital nurse for refusing to provide a patient’s blood sample back in July has been circulating this weekend, but it was a high speed police pursuit ending in an explosive crash that led up to the hospital incident. Alex Wubbels, a nurse for the burn center at the University of Utah hospital, was attacked and arrested by a police officer on July 26 and detained in a squad car for 20 minutes after refusing to provide a blood sample to a police investigation, as the patient was unable to give consent and was not suspected of a crime. The incident has gone viral in recent days following the release of police body cam footage showing the attack in the reception area of the hospital. The hospital incident was a result of a high speed police chase, where video shows the suspect being pursued swerving into the front of a semi-truck, which subsequently exploded, killing the suspect and badly injuring the semi-truck driver with burns. That truck driver was nurse Wubbel’s patient, and was not a suspect in the police investigation, justifying her defense against police. It’s unclear why detectives wanted a blood sample from the victim of a police pursuit. According to Fox13, police were pursuing a black Chevy Silverado after multiple reports of erratic driving. 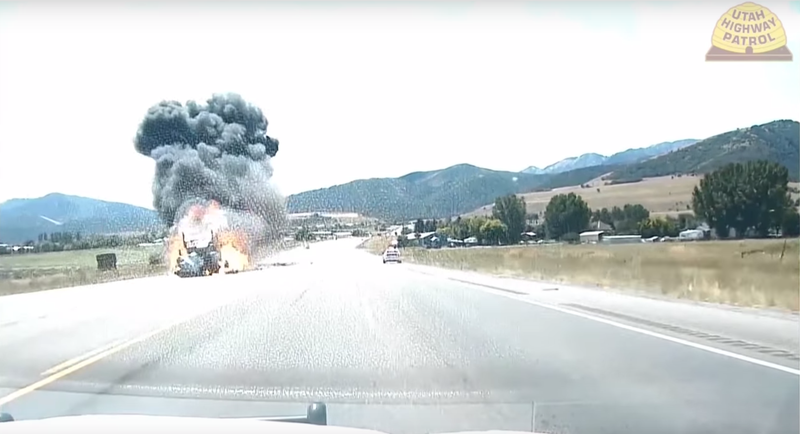 The truck ran from police, eventually swerving into oncoming traffic and colliding directly into the front of a semi-truck, causing an explosion. According to the report, the driver of the semi-truck got out of the truck and was on fire before being extinguished by an officer. He was then eventually air-lifted to University of Utah hospital and put under the care of staff, including nurse Wubbels. The badly injured truck driver was identified as William Gray, a reserve police officer for the Rigby, Idaho Police Department. Since Gray was not the suspect of a crime, and at the time was not conscious to provide consent, the hospital staff refused to provide police a blood sample without a suitable warrant. [Attorney Karra Porter] said Payne argued that he was allowed to take the blood through a process known as “implied consent.” But she said that law was changed years ago. Salt Lake Police Sgt. Brandon Shearer said Thursday that Chief Mike Brown has seen the video and called it “very alarming.” Payne is still on active duty with the department, but Shearer said he has been suspended from the blood draw program and an active internal investigation is underway. Wubbels is waiting to file any sort of legal action against the police department, citing a belief “in the goodness of society,” and hopes that the department will take the necessary action for growth and re-education, according to KSL.com. She said if that doesn’t happen, they may be forced to take further action. Editor’s note: The leading image of this post was replaced to reflect the sensitive nature of the incident.